A full page ad from NME, may 1977. 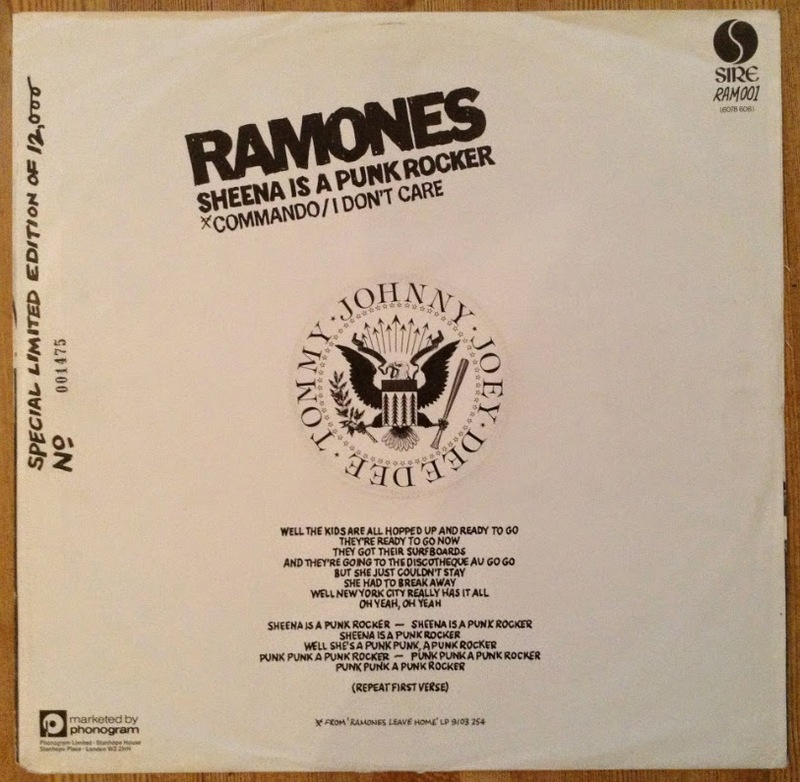 The release of Sheena Is A Punk Rocker in the UK was backed up with full page ads in the music press – and a t-shirt offer. 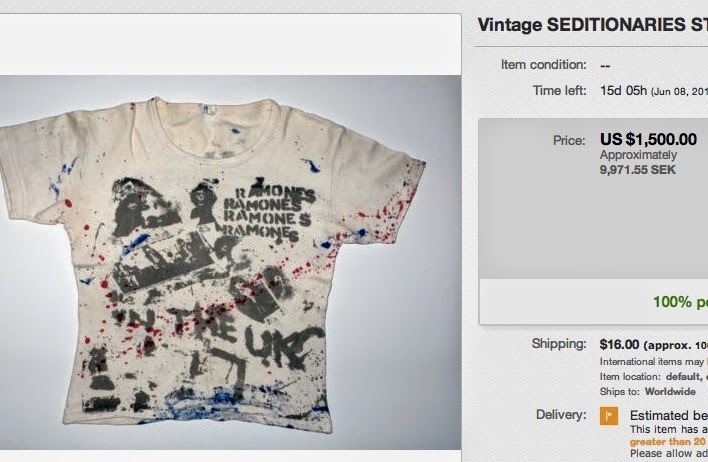 The first 1 000 buyers who posted the Ramones eagle emblem from the back of sleeve together with 99p got an "hand-finished T-shirt". The campaign resulted in a peak at number 22 in the UK single chart. 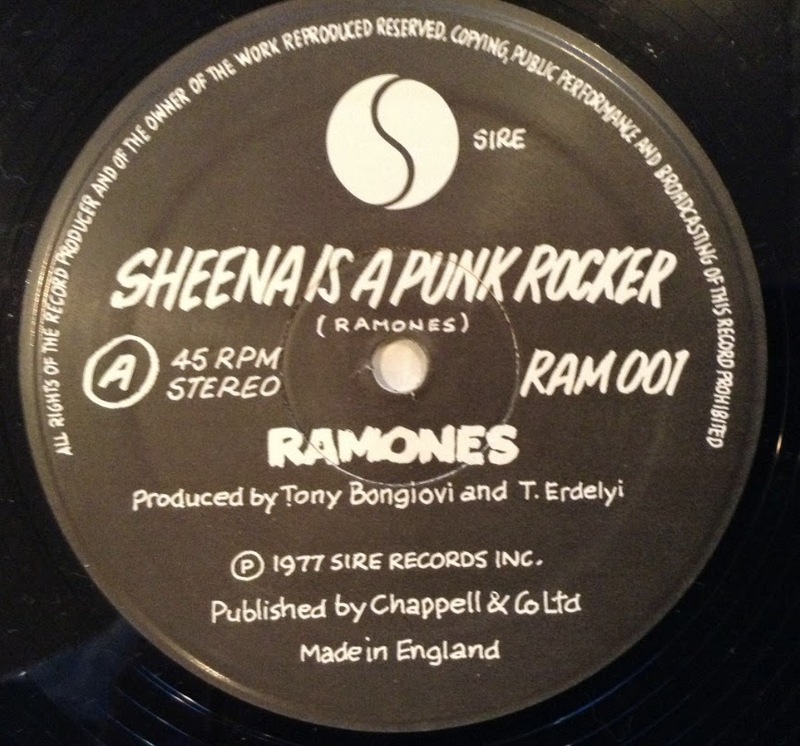 Sheena was released in the UK in may 1977 both as a 12" and a 7" single. The 12" has a great picture sleeve with the perforated eagle eagle emblem on the back for the T-shirt offer. It is limited to 12 000 numbered copies. 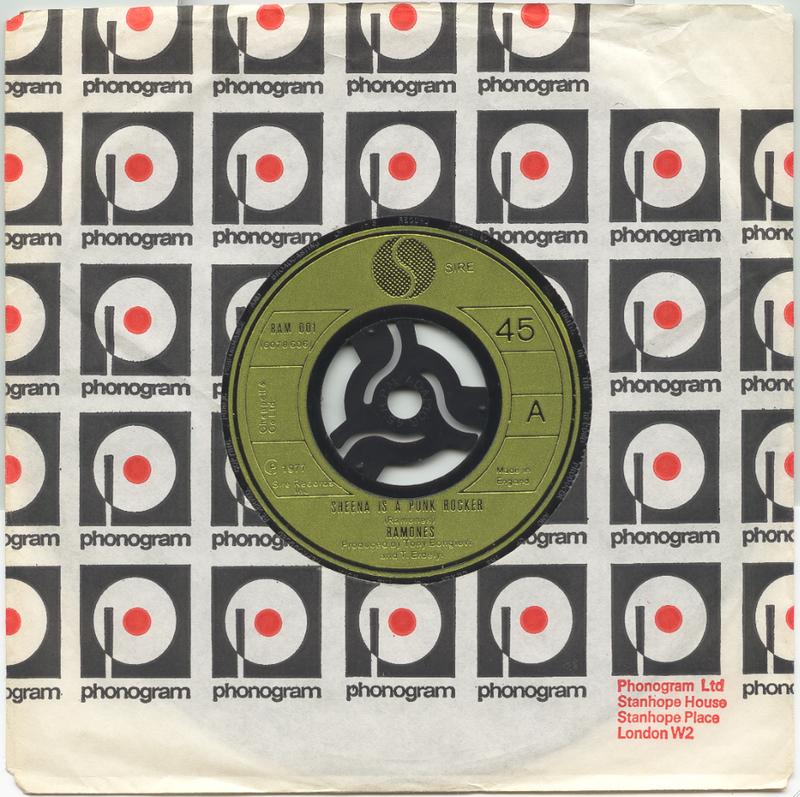 The single, on the other hand, only came in a Phonogram company bag, no picture sleeve. Notes: Pressed in 12 000 numbered copies. Injection moulded labels, solid centre. DJ-copy with big centre hole. 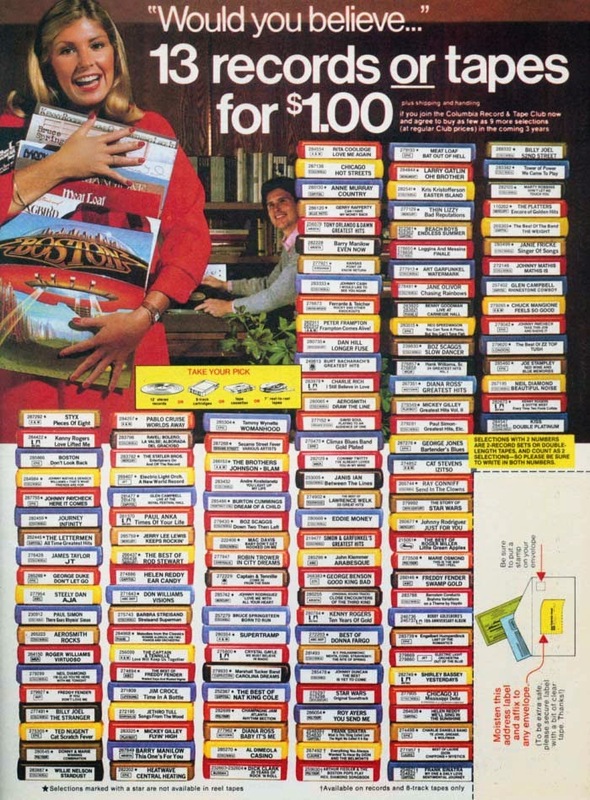 tapes until 1988 and vinyl albums until 1992. Columbia Record Club, CRC, was formed in 1955 by CBS/Columbia Records. The idea was to distribute records directly by mail. By 1975 the record club had over 3 million members. 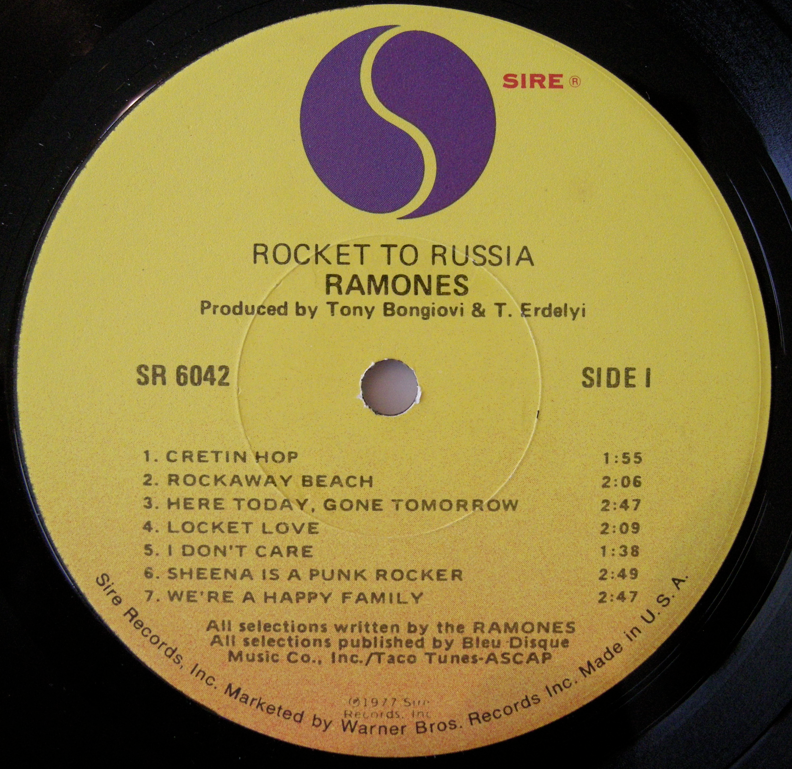 In 1977 Rocket To Russia was offered to the these members. The copies I have seen has all been pressed at the Columbia pressing plant in Santa Maria, CA (identified by the code S1 handwritten in the dead wax). The labels of these CRC releases have a different look compared with the normal Sire/Warner release. The typesetting is different and the Columbia pressings has a bigger circular indent on the labels. This is the easiest way to identify them. But the Columbia staff had problems marking the labels with the correct distributor. 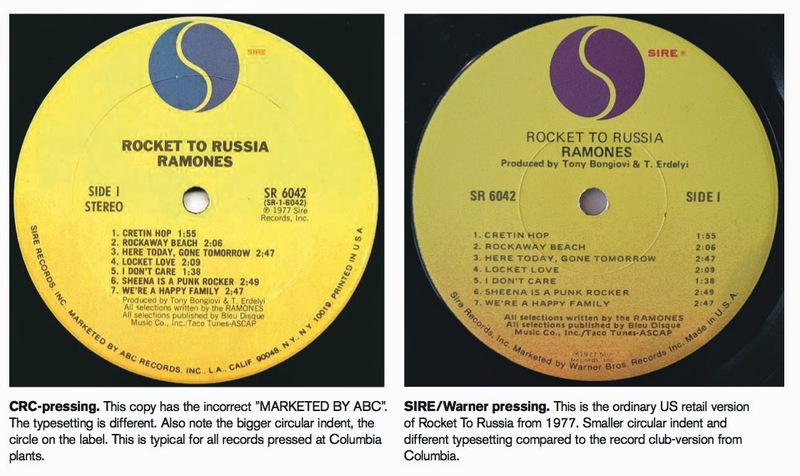 Some copies have "MARKETED BY ABC RECORDS" in the outer rim (wrong, it was Warner by the time of the release of Rocket To Russia), other have the correct information "MARKETED BY WARNER" and a third version have no info at all. 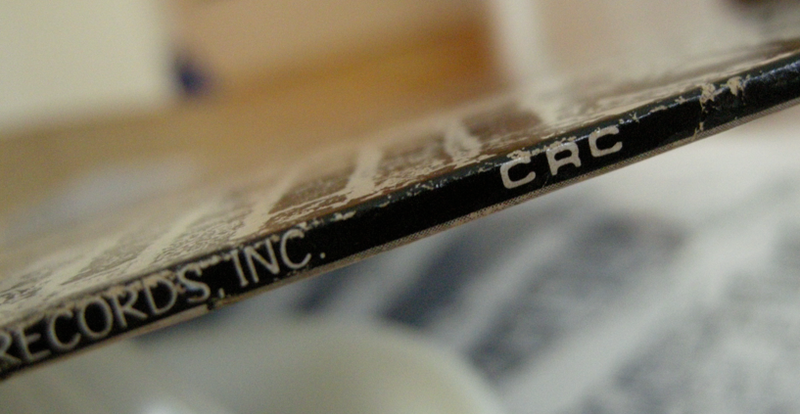 The sleeve marked with "CRC" on the spine. The only sign on the sleeve that this is a record club release is a small "CRC" printed on the spine (see picture). But I have also seen copies without the mark, if these records have ended up in a wrong sleeve somewhere or if CRC printed sleeves without the mark, I don't know. Same goes for the printed inner sleeve with lyrics. Some copies have the inner, some don't. Notes: Pressed at the Columbia Santa Maria Pressing Plant (S1) for Columbia Record Club. No info in the outer rim. Notes: Pressed at the Columbia Santa Maria Pressing Plant (S1) for Columbia Record Club. Marked with Warner in the outer rim. The sleeve has CMC on the spine. Apart from the CMC mark the sleeves are the same as on the ordinary retail version. The same goes for the inner sleeve. Here are the two versions of the Meltdown 10"
As I have written before, those responsible the Record Store Day continues to go for Ramones when they decide what to be release for the yearly event. 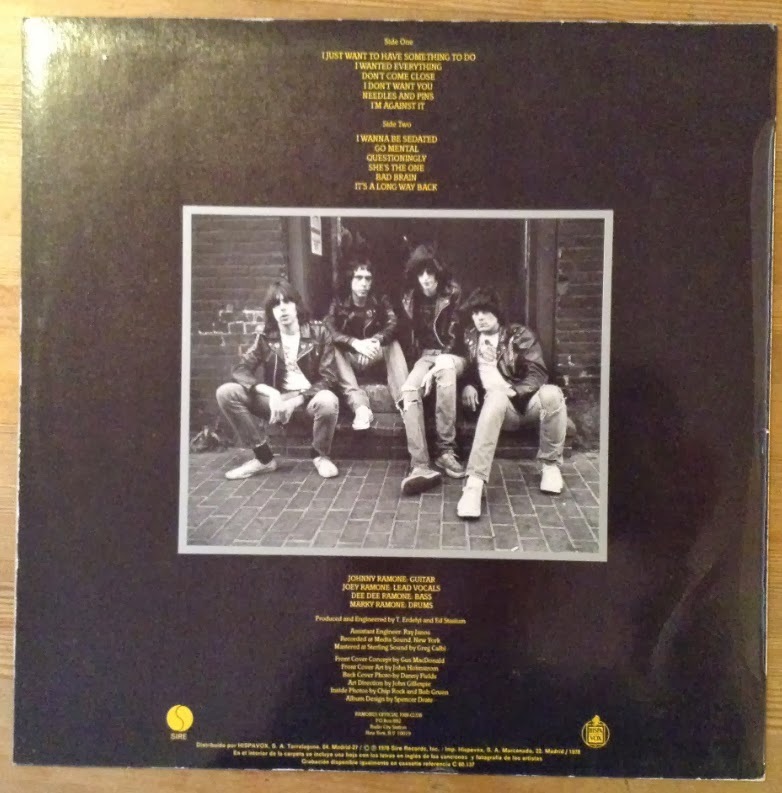 This time, on april 4, they offered a 10" version of the 1980 EP Meltdown with the Ramones. There are two versions of this release, in Europe the record is on pink vinyl, the US version is on blue vinyl. The european version is limited to 750 copies, the US version is pressed in 3 000 numbered copies. Is this the last official Ramones vinyl release? I doubt it. Notes: Record Store Day release in USA. Blue vinyl. 3 000 copies., numbered. Notes: Record Store Day release in Europe. Pink vinyl. 750 copies. 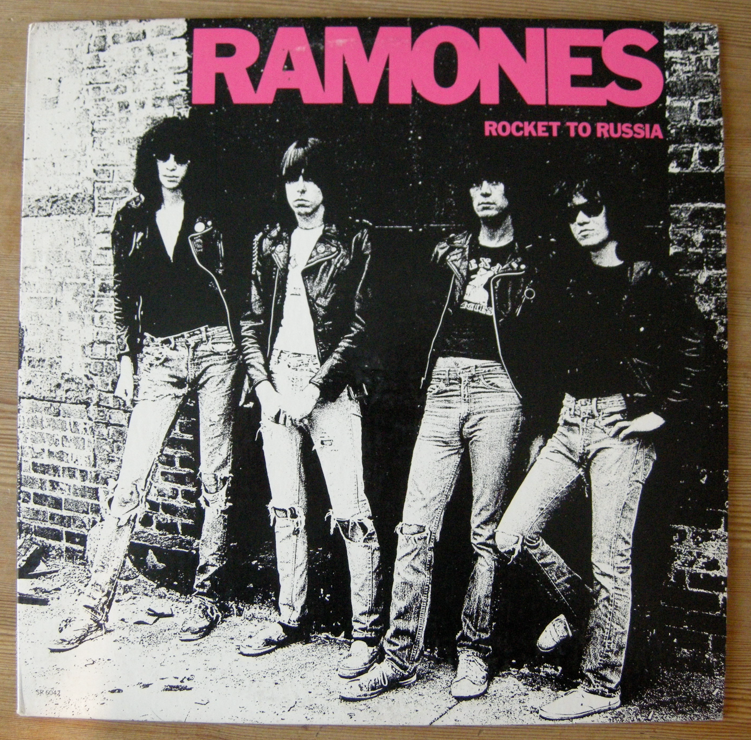 Ramones third album Rocket To Russia captures the band at their absolute peak. If I had to chose one Ramones album for the rest of my life it would be this one. 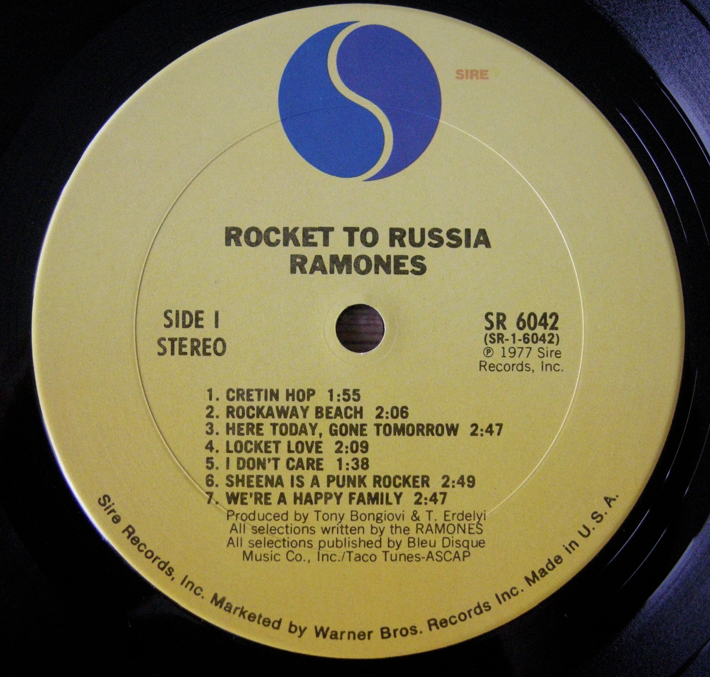 The record was originally called Ramones Get Well but somewhere in the process the title was changed. 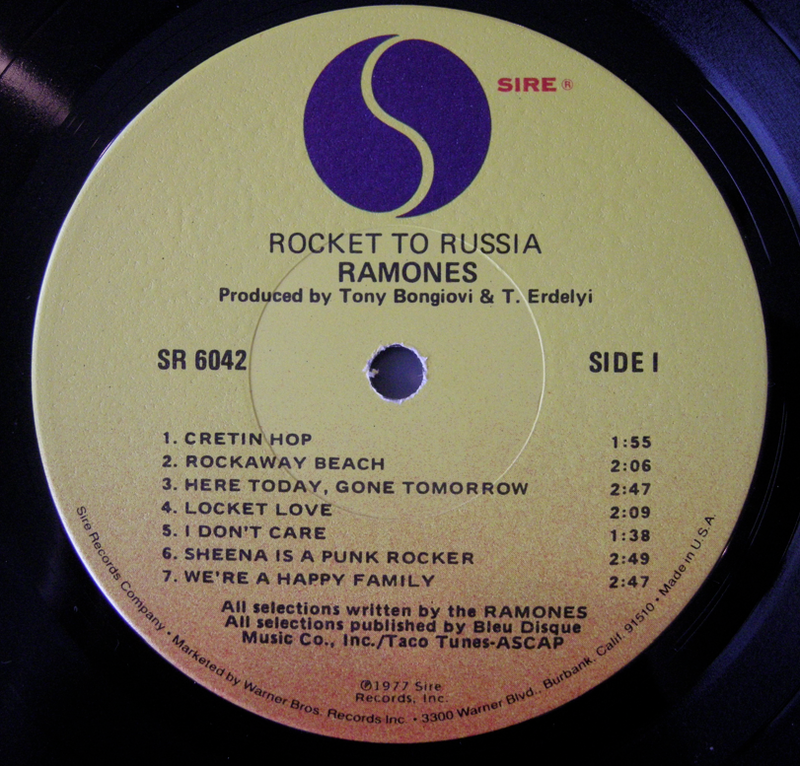 Rocket to Russia was the name of a song that in the end transformed into Ramona. In august 1977 the band started the recordings with engineer Ed Stasium at the Media Sound Studio in NYC. The total cost for the recording was between $25,000 and $30,000 and in November 4, 1977 the album hit the stores. This time with the mighty Warner as distributor instead of ABC. But even if the album got a full record-company support it only charted on the US Billboard at number 49. Identified by: Pressing plant-code LW in the matrix number along with a six pointed star "✲" stamped into the vinyl. The star stands for Hollywood. Capitol Records Pressing Plant, Jacksonville, ILIdentified by: Pressing plant-code JW in the matrix number along with the symbol "O" stamped into the vinyl. All pressings have "STERLING" stamped into the dead wax. It stands for Sterling Sound, NYC, the mastering house. 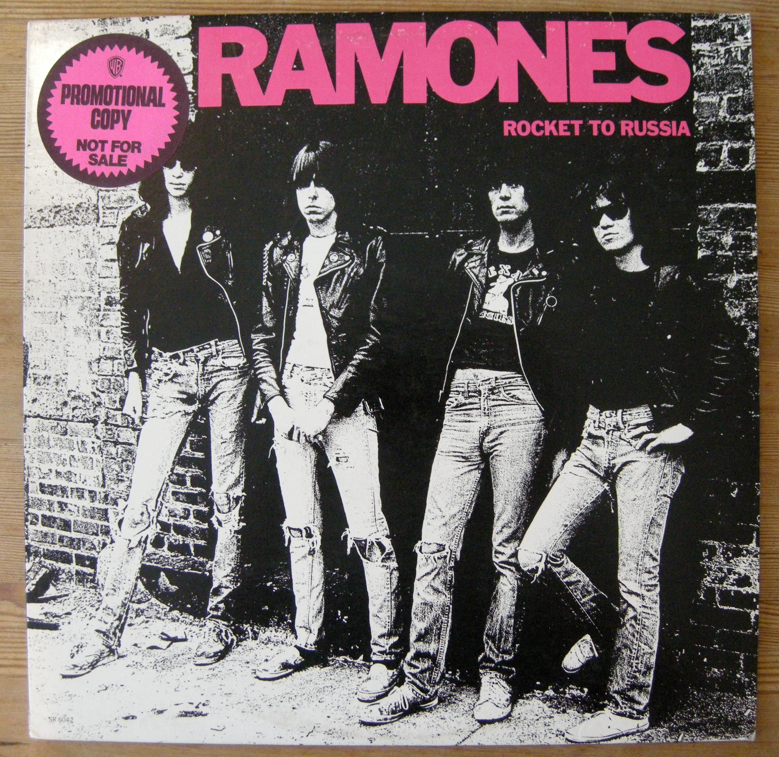 Over the years Rocket To Russia has been released and rereleased and rereleased again. Here is an attempt to sort out the different US pressings. I stick to the era before the bar code. Everything with a bar code is obviously a repress in this case. Notes: Pressed at the Capitol plant in Los Angeles (LW). This copy also includes a two pages press release and two photos. First press with no Warner address. 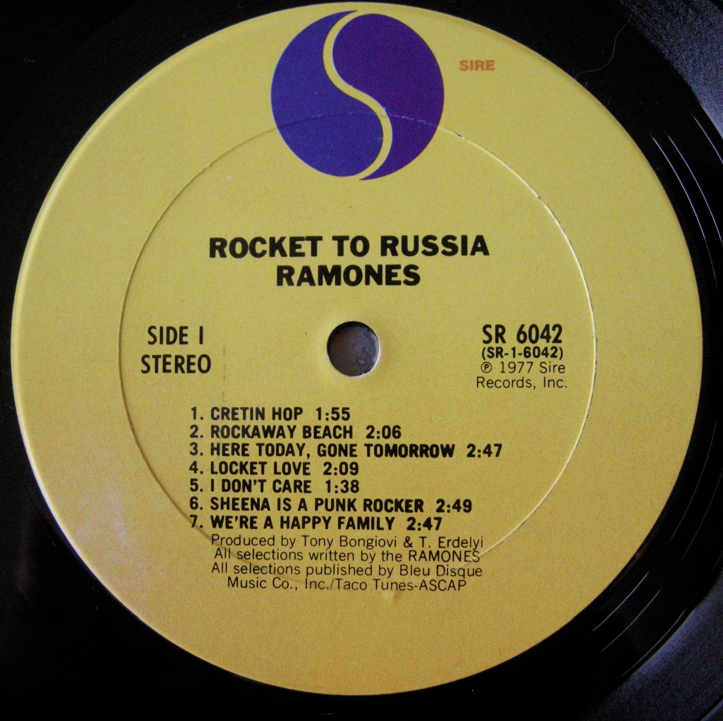 Notes: This is the first US press of Rocket To Russia. The easiest way to identify it is by the perimeter text round the bottom part of the label. The text is smaller and don't have the Warner Burbank address as on the second pressing. 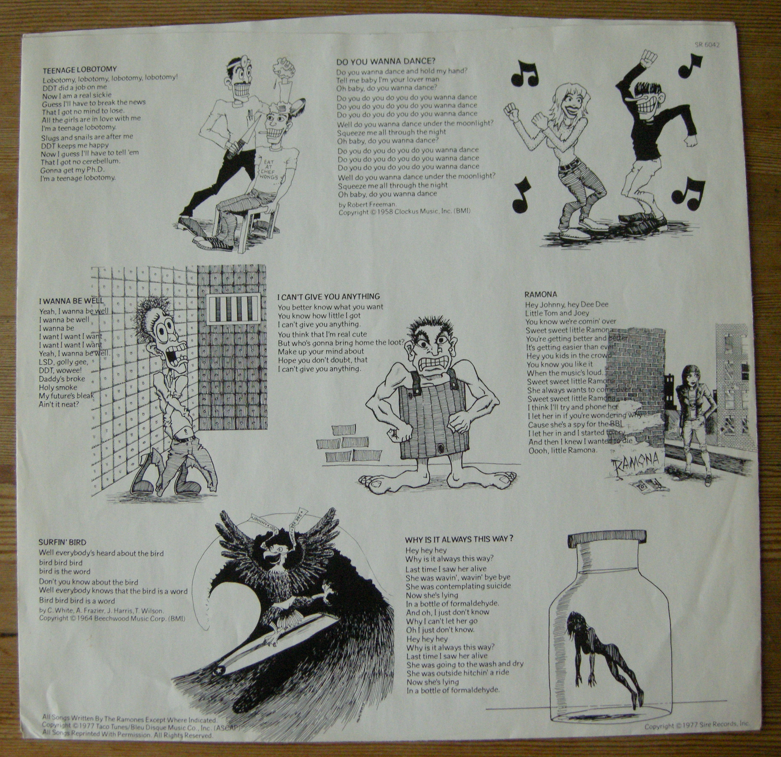 Includes printed inner sleeve with lyrics. Notes: Actually the stock version but with a promo-sticker on the sleeve. Once again a Los Angeles-pressing. 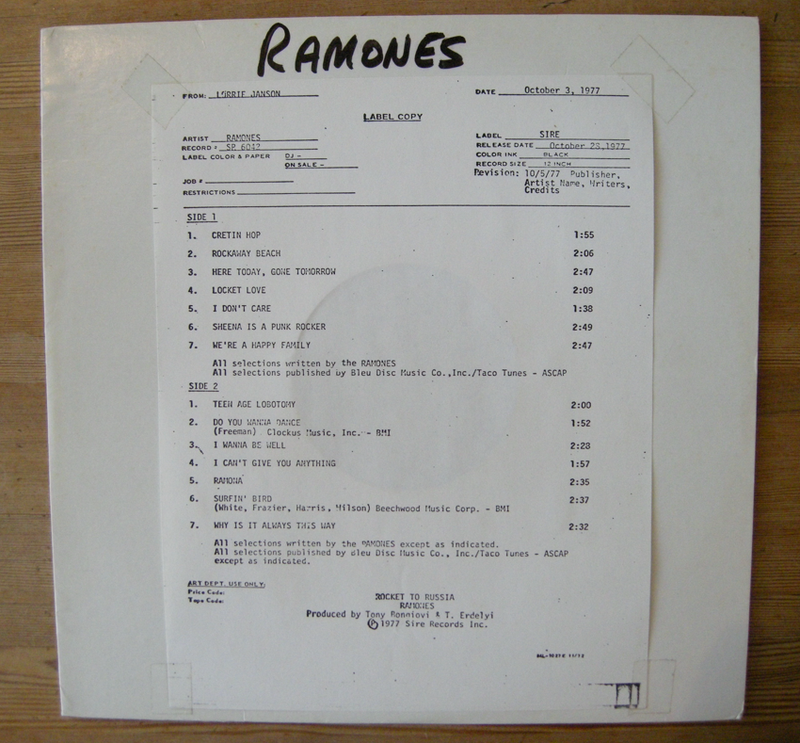 All US Ramones promo singles between 1977 and 1981 was press at the Los Angeles pressing plant but I'm not sure if it's the same with the albums. The record has the same labels as the stock version. 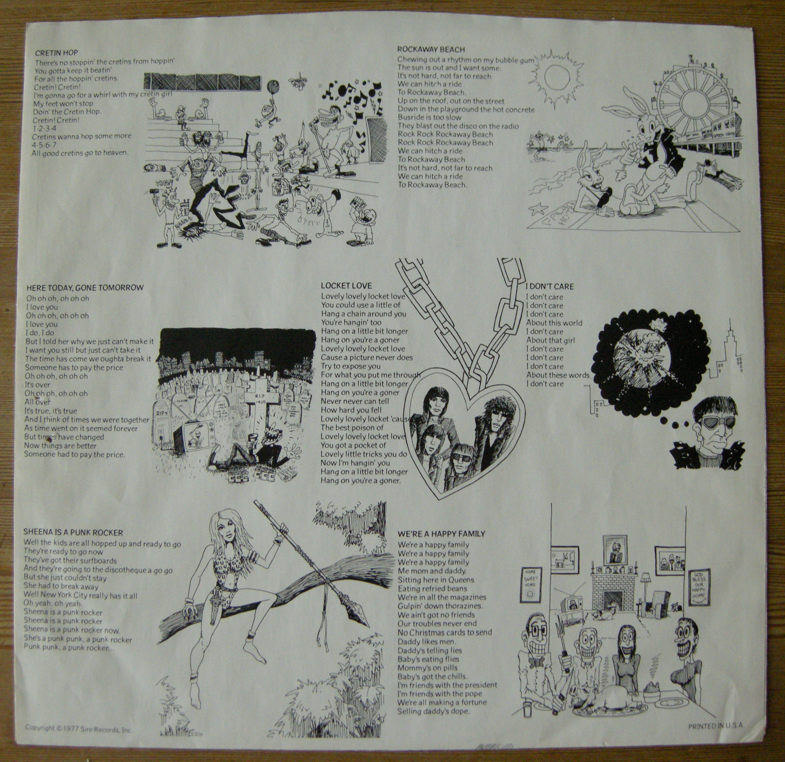 Includes printed inner sleeve with lyrics. Second press with full Warner address, smaller text. Year: Sometime in the early 80's. Notes: The second press has the same sleeve and innersleeve as the the first press. The only difference is the Warner Burbank address in the text at the bottom of the label. This copy is pressed at the Winchester plant, I don't know if the second press was made anywhere else. Third press with no perimeter text at all. Ramones records here in the 80's. Year: Not sure, in the late 80's, I think. Notes: This record was made by a fourth pressing plant that Warner started to use in the 80's, Speciality Records Corp., Olyphant PA. Code: SR. Even if this copy still have the WW-code on the A-side both sides are marked with the Speciality Records logo. 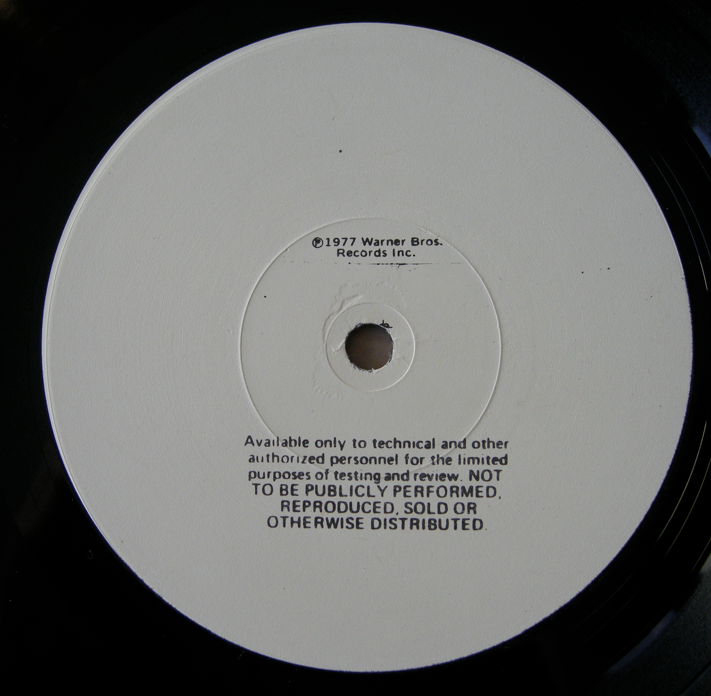 And the matrix number on side B includes SR.
Notice the different label on this one – no perimeter text at all. 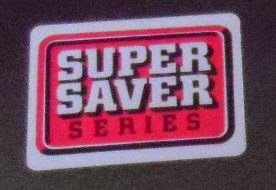 This was sold at a lower price as a part of the Super Saver-series. No printed inner sleeve, Super Saver-series-sticker on the shrink wrap. Meltdown is back – bigger than ever! 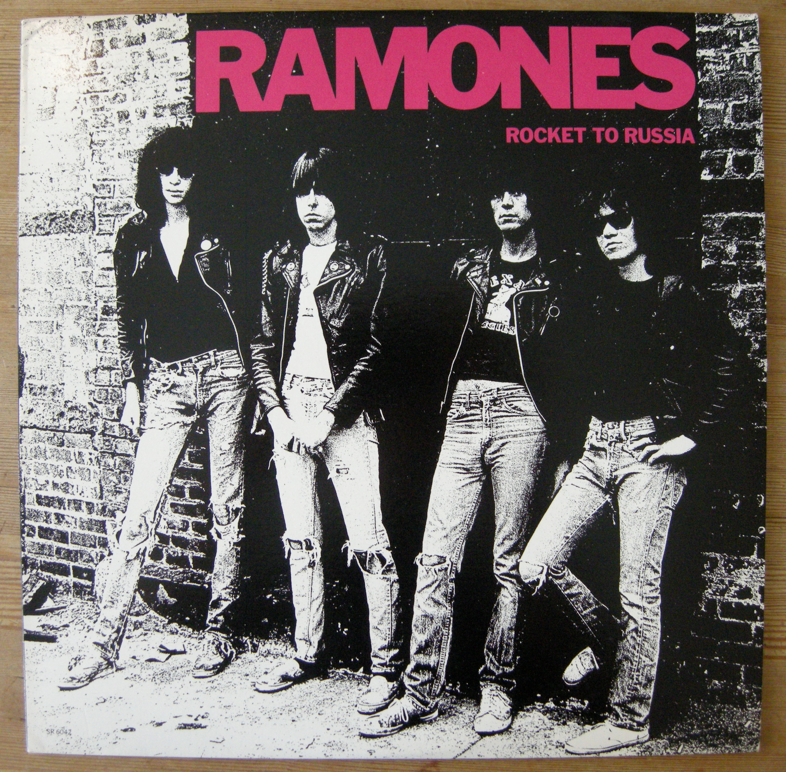 Almost 18 years after The Ramones split up there are still "official" vinyl coming out. 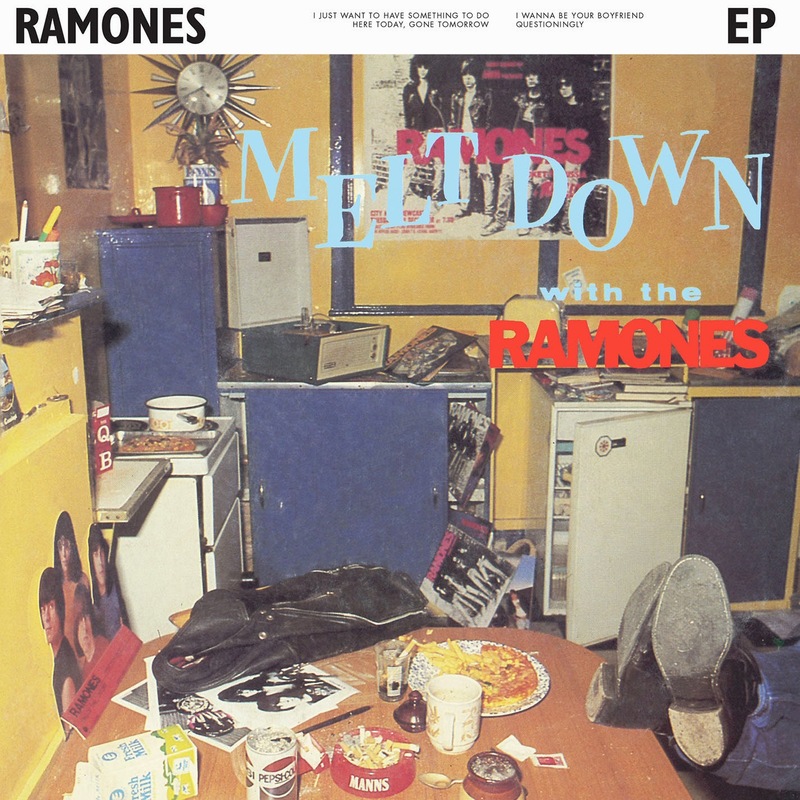 The latest one is a 10" vinyl version of the 1980 EP Meltdown With The Ramones. This time it is a special pressing on colored vinyl that will be sold on Record Store Day, april 19, 2014. "Released for the first time ever in the States on navy vinyl", is the message on the official Record Store Day website. The record label is Rhino. Read more about the original Meltdown EP here. 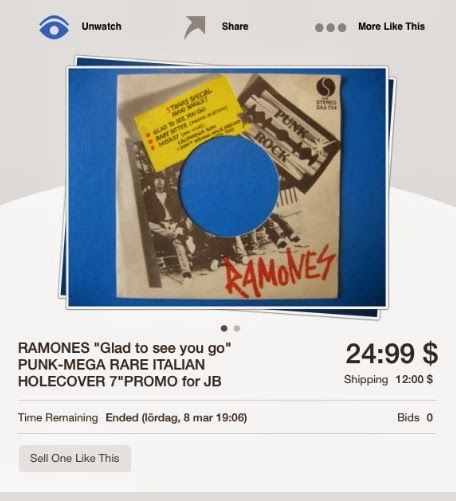 Recently someone on Ebay tried to sell this “rare holecover” for a “jukebox edition” of first italian Ramones single with Glad to see yo go + three tracks. I couldn’t get this together. First of all there is no jukebox edition of this single. And if someone distributed the record to jukebox owners, why cut a hole in the cover? Italy has a remarkable amount of jukebox editions, records specially made for jukeboxes and often with two different artist on A and B-side. The history behind these special editions goes back to the second world war. After the war a lot of jukeboxes came to Italy with US military transports. The jukeboxes ended up in bars and restaurants around the country but a big problem for the owners was the price of the records, they where to expensive. By this time two italians friends that had met in the army got an idea. One of them worked in a record store and the other was the son of a the italian RCA manager in Rome. The idea was to distribute singles exclusive for jukeboxes and reduce the cost by not selling the to the public and not use any picture sleeves. 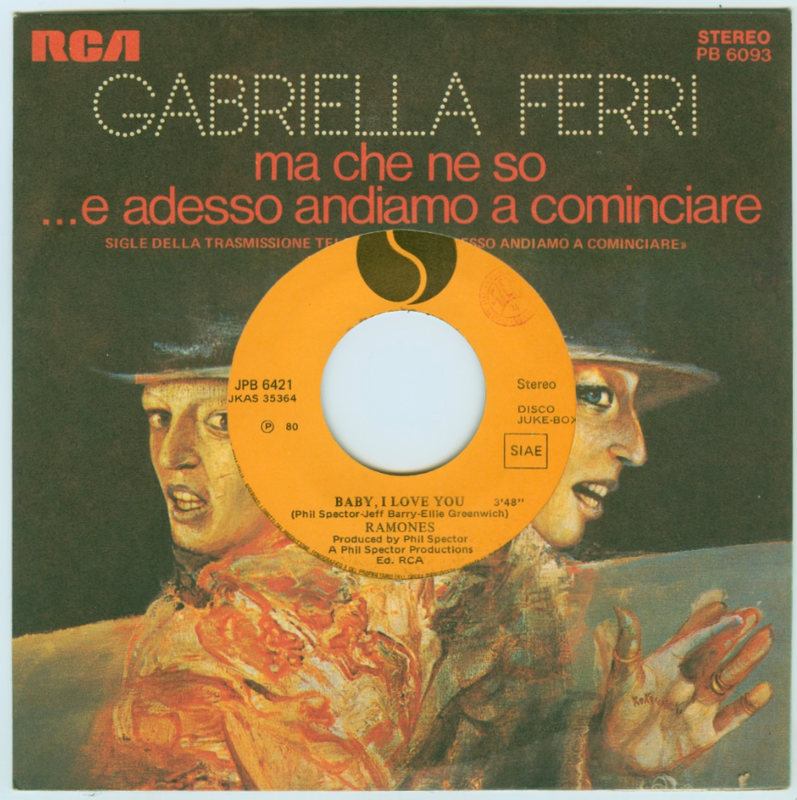 The first jukebox editions was the same pressings as the normal retail version of the record but with a stamp telling that the record was “Edizione speciale per Juke box - Vietata la vendita”, Special Jukebox edition – not for resale. The records was sold to a reduced price and distributed in RCA company sleeves. But soon dishonest sellers discovered that they cold remove the stamp and sell the records and double the profit. This is why the record labels in Italy started press special jukebox editions and to make it even more valuable for the jukebox owners they usually put an local artist on one side and a bigger, international artist on the other. Two hit songs at the price of one. Or a half, more particularly. Another way to reduce cost was to use surplus picture sleeves that had remained unsold, cut a hole in them with the size of the label of the record and distribute the jukebox editions in these “holecovers”. They were called “neutral covers” and was used radomly. This brings us back to the The Ramones “holecover sleeve” on Ebay. 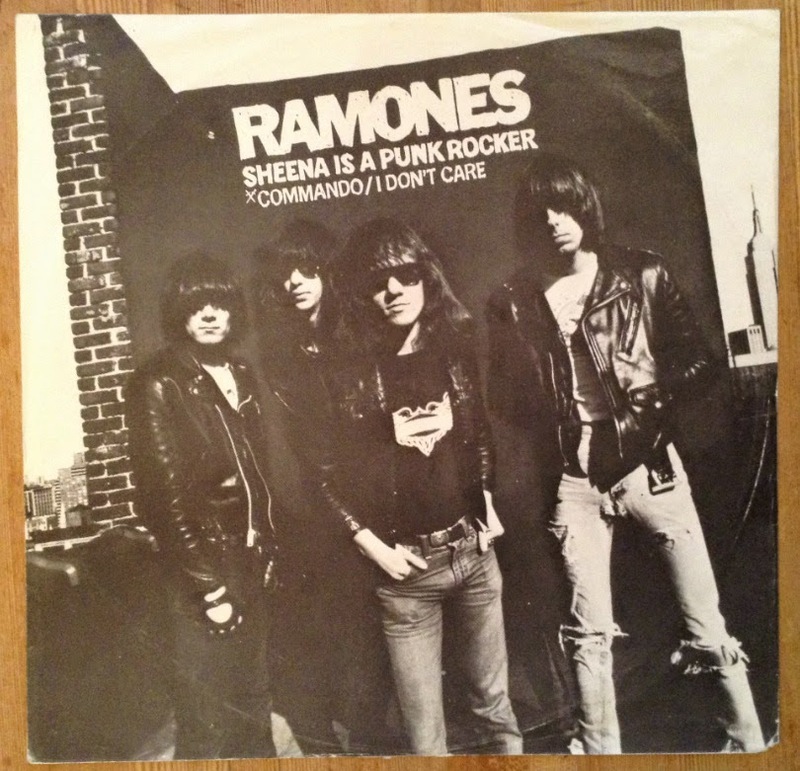 This sleeve was made for a jukebox edition single – but not especially for a Ramones record. Any jukebox record could end up in the sleeve. 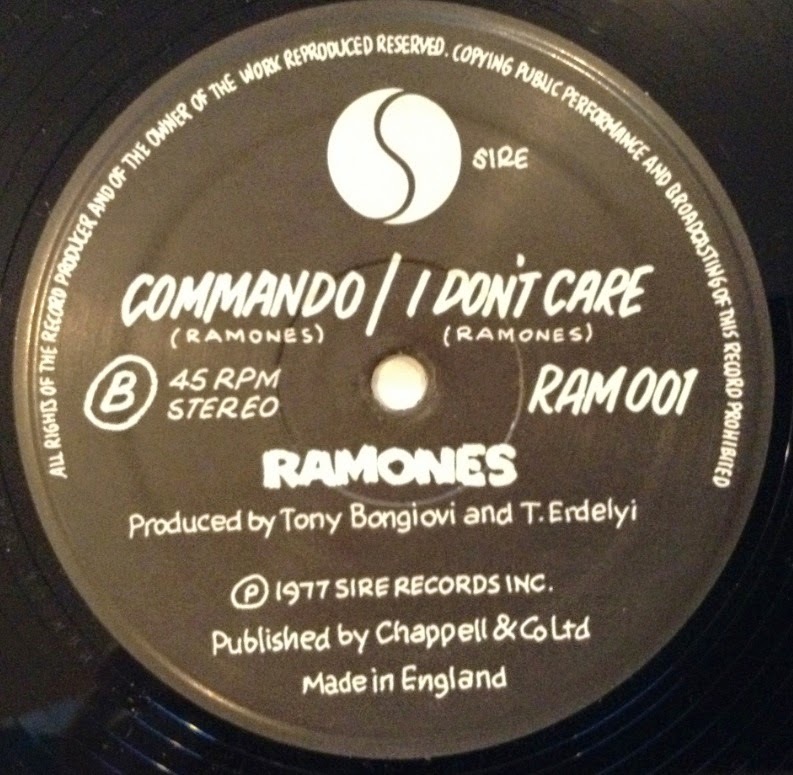 The only italian jukebox single with a Ramones song is Baby I Love You with the italian band Contessa on the flip. 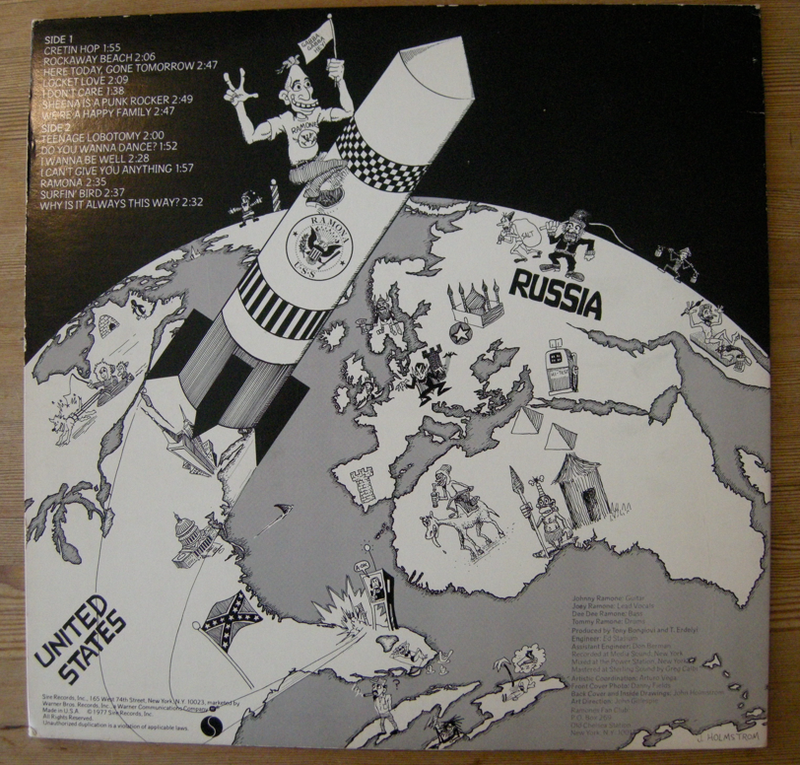 This is how I have seen that single being sold, in a holecover sleeve with an "random" italian artist. Finally, the italian jukebox singles should not be considered as promos. 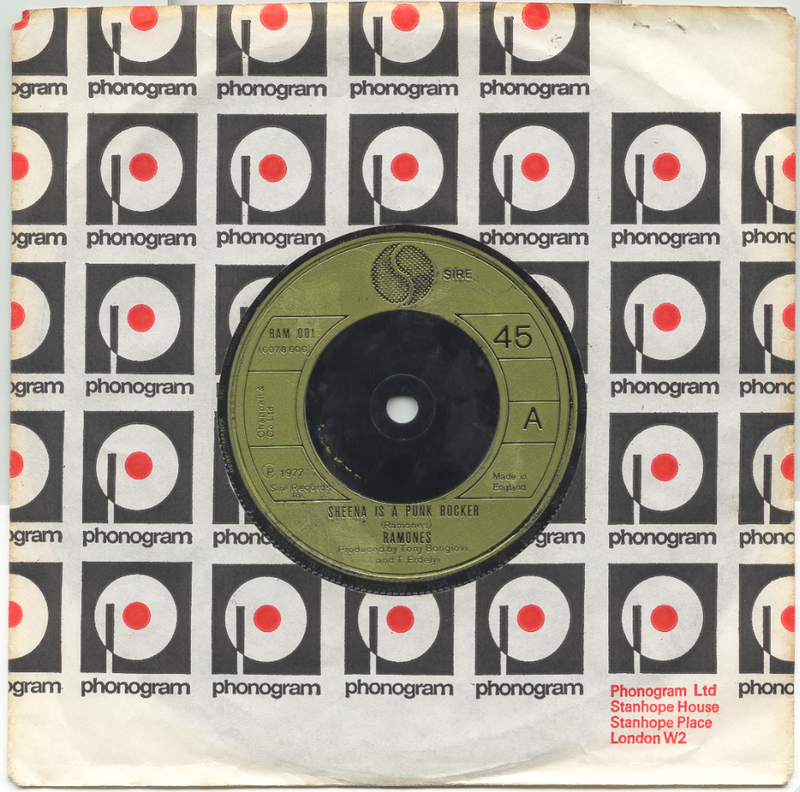 A promo record is not for sale, the jukebox editions was sold but to a reduced price. From 1985 the biggest independent label in Australia, Mushroom Records, had a foreign licensing division called Liberation Records. In 1989 they got the license deal for the new Ramones album, Brain Drain. Liberation released the album for the australian market along with the single Pet Sematary. The single was issued with a different picture sleeve compared to the rest of the world – but things got wrong. 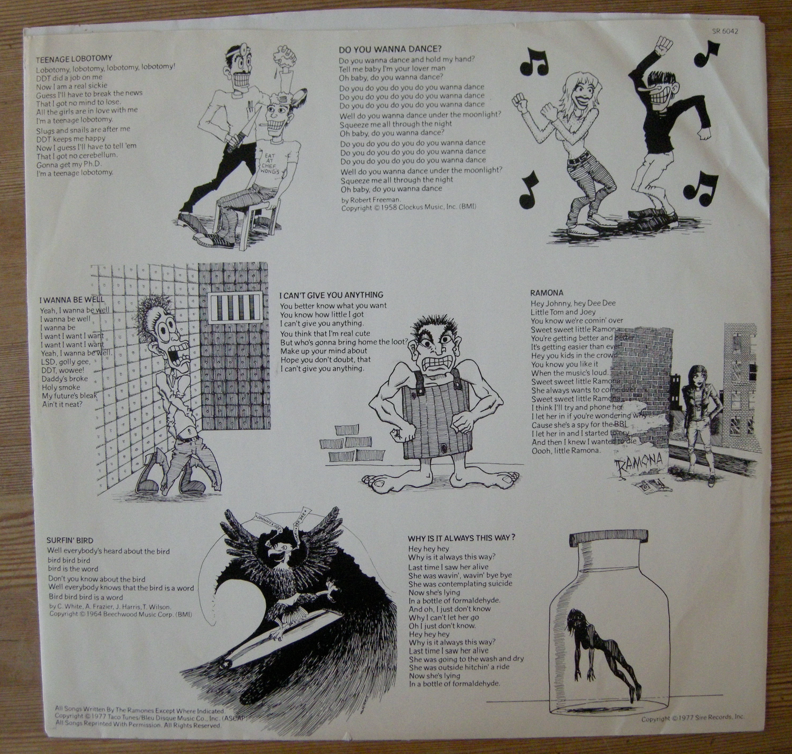 The writing credits on the back of the sleeve are mixed up and the sleeve was withdrawn. 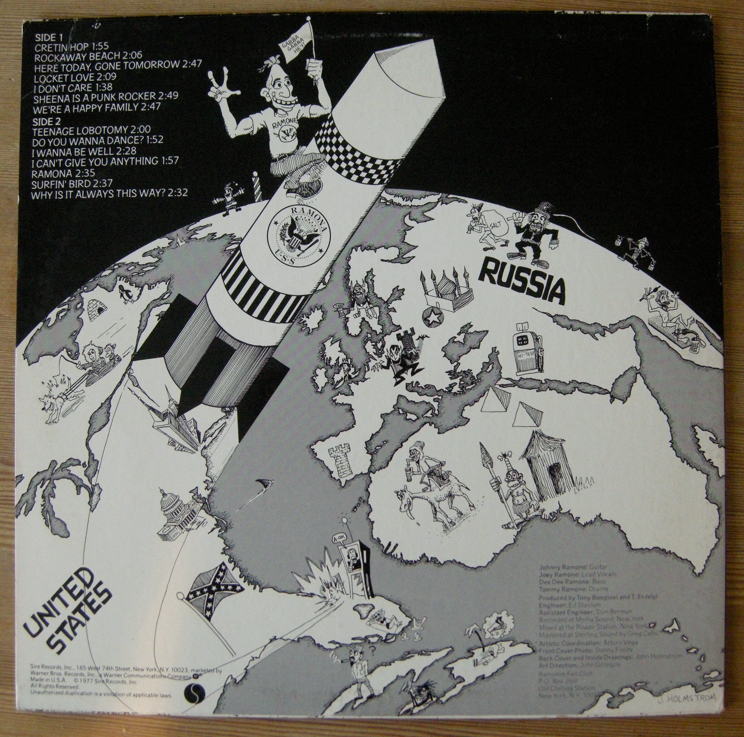 The single was sold in an australian CBS company sleeve. Still it's not that hard to find a copy with the picture sleeve so I guess a lot of them ended up for sale anyhow. Read more about the single here. After Brain Drain Liberation released three older albums in reverse order. Halfway To Sanity came out in 1989, Animal Boy and Too Tough To Die was released the year after, in 1990. Brain Drain has the printed inner sleeve, the rest of the albums came in a plastic inner bag only. For some reason the first two releases have a barcode but not Animal Boy and Too Tough To Die. Notes: With printed inner sleeve. 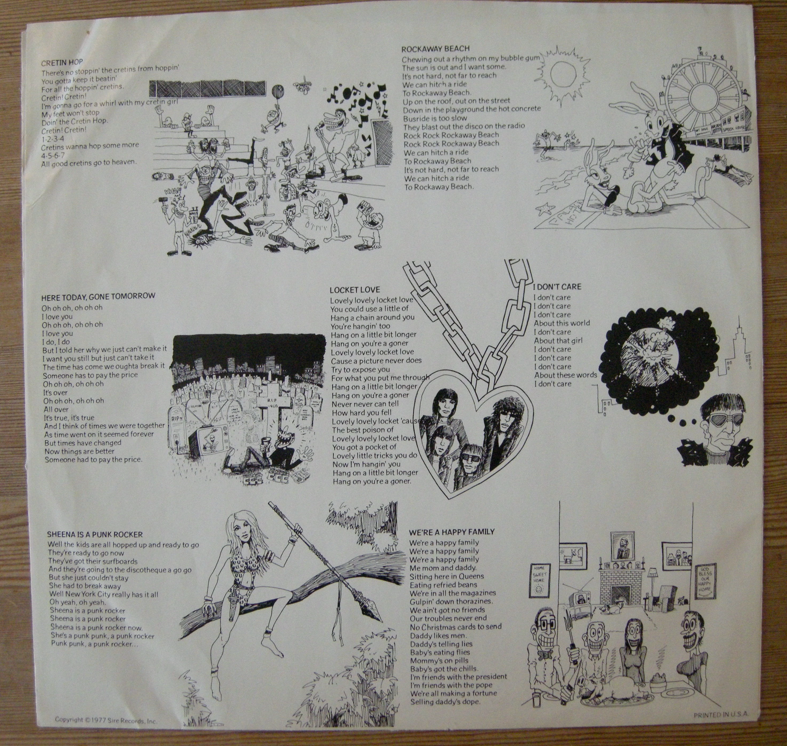 Notes: No printed inner sleeve. 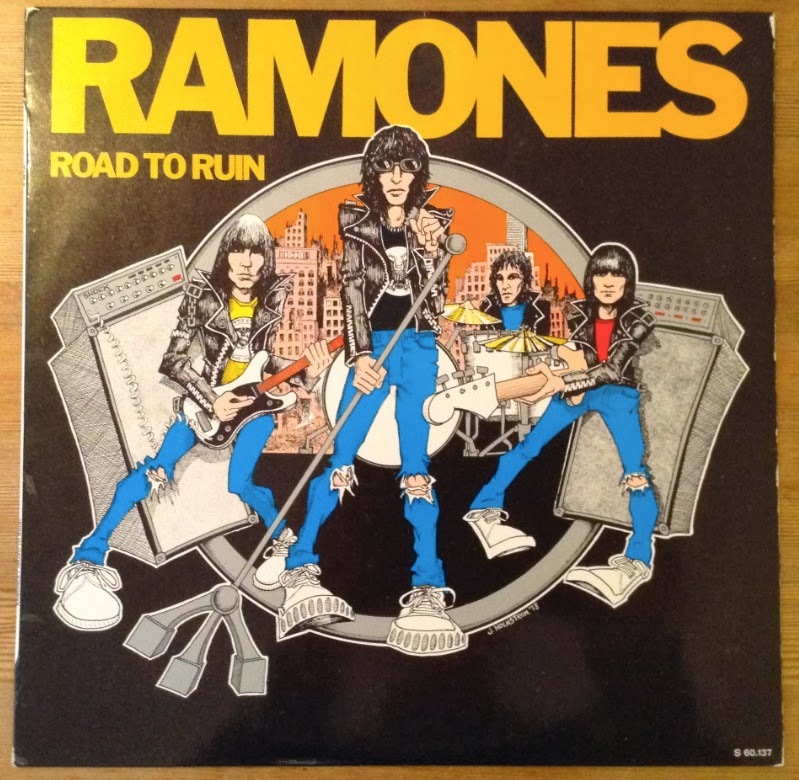 Road To Ruin was released in Spain in 1978 by Hispavox. It makes it the second Ramones album in Spain after Leave Home the year before. 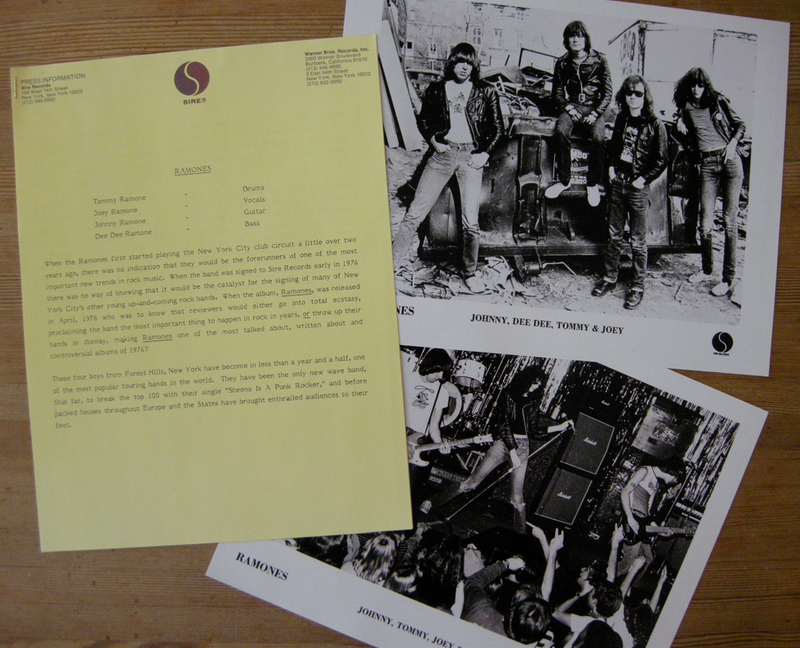 There are two versions of the spanish Road to Ruin, one has a yellow insert with lyrics. the other has text that wraps around the entire label and a black and white insert. The labels on the latter have the same design as on the spanish Pleasant Dreams, released in 1981. That, and the different matrix number, makes me convinced that the version of Road To Ruin with black and white insert is a second pressing. Another difference between the two versions is the weight, the first pressing is pressed on 150 g vinyl, the second on 125 g vinyl. The sleeve looks the same on both versions, laminated and with the Hispavox logo on the back. Notes: First press with yellow insert. Weight: 150 g.
Notes: Second press with black and white insert. 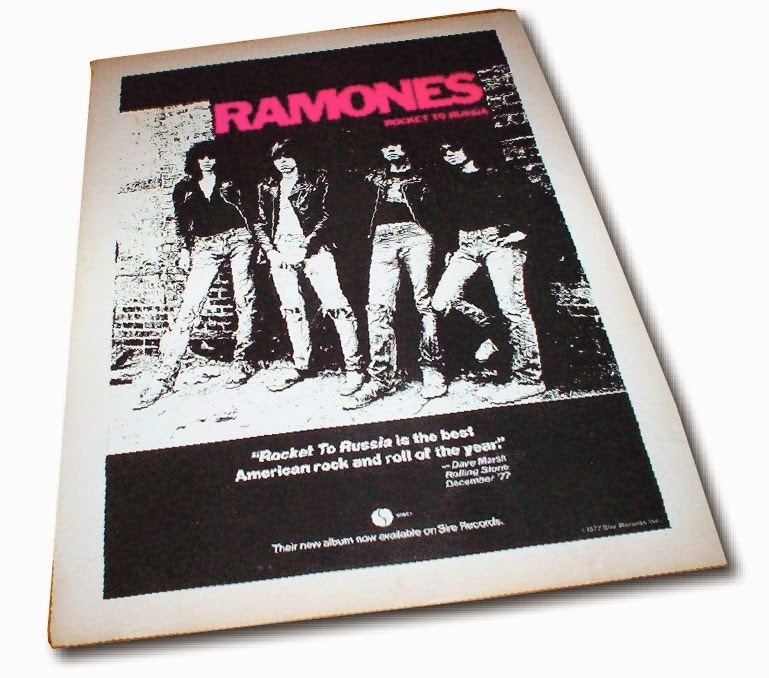 Weight: 125 g.
I'm a Ramones-collector from Scandinavia and this blog is about Ramones records – only. If you have more information, find anything wrong or have something else to say, contact me. 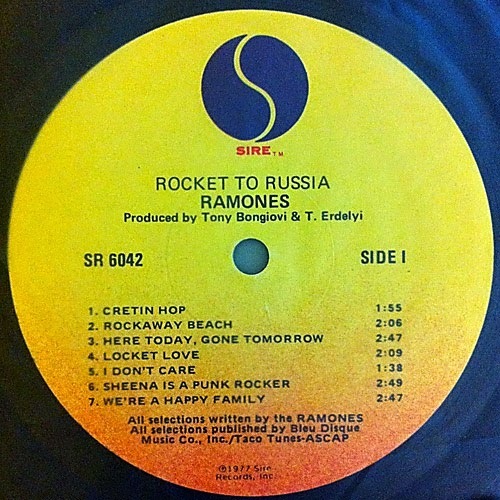 ramonesonvinyl@gmail.com Hey ho let's go!